Welcome to the LitCharts study guide on Alice Walker's The Color Purple. Created by the original team behind SparkNotes, LitCharts are the world's best literature guides. A concise biography of Alice Walker plus historical and literary context for The Color Purple. A quick-reference summary: The Color Purple on a single page. In-depth summary and analysis of every chapter of The Color Purple. Visual theme-tracking, too. Explanations, analysis, and visualizations of The Color Purple's themes. The Color Purple's important quotes, sortable by theme, character, or chapter. 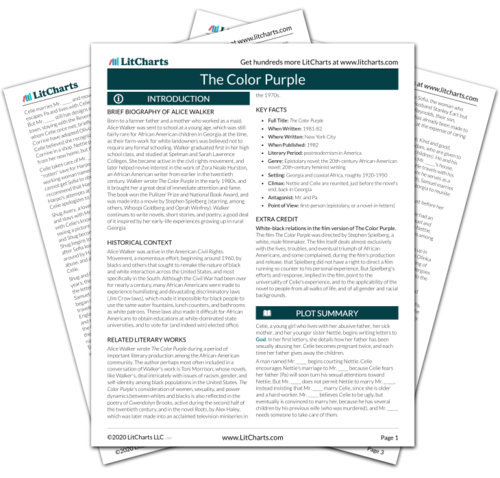 Description, analysis, and timelines for The Color Purple's characters. Explanations of The Color Purple's symbols, and tracking of where they appear. An interactive data visualization of The Color Purple's plot and themes. Born to a farmer father and a mother who worked as a maid, Alice Walker was sent to school at a young age, which was still fairly rare for African American children in Georgia at the time, as their farm-work for white landowners was believed not to require any formal schooling. Walker graduated first in her high school class, and studied at Spelman and Sarah Lawrence Colleges. She became active in the civil rights movement, and later helped revive interest in the work of Zora Neale Hurston, an African American writer from earlier in the twentieth century. Walker wrote The Color Purple in the early 1980s, and it brought her a great deal of immediate attention and fame. The book won the Pulitzer Prize and National Book Award, and was made into a movie by Stephen Spielberg (starring, among others, Whoopi Goldberg and Oprah Winfrey). Walker continues to write novels, short stories, and poetry, a good deal of it inspired by her early-life experiences growing up in rural Georgia. Alice Walker was active in the American Civil Rights Movement, a momentous effort, beginning around 1960, by blacks and others that sought to remake the nature of black and white interaction across the United States, and most specifically in the South. Although the Civil War had been over for nearly a century, many African Americans were made to experience humiliating and devastating discriminatory laws (Jim Crow laws), which made it impossible for black people to use the same water fountains, lunch counters, and bathrooms as white patrons. These laws also made it difficult for African Americans to obtain educations at white-dominated state universities, and to vote for (and indeed win) elected office. Alice Walker wrote The Color Purple during a period of important literary production among the African-American community. The author perhaps most often included in a conversation of Walker's work is Toni Morrison, whose novels, like Walker's, deal intricately with issues of racism, gender, and self-identity among black populations in the United States. The Color Purple's consideration of women, sexuality, and power dynamics between whites and blacks is also reflected in the poetry of Gwendolyn Brooks, active during the second half of the twentieth century, and in the novel Roots, by Alex Haley, which was later made into an acclaimed television miniseries in the 1970s. White-black relations in the film version of The Color Purple. The film The Color Purple was directed by Stephen Spielberg, a white, male filmmaker. The film itself deals almost exclusively with the lives, troubles, and eventual triumph of African Americans, and some complained, during the film's production and release, that Spielberg did not have a right to direct a film running so counter to his personal experience. But Spielberg's efforts and response, implied in the film, point to the universality of Celie's experience, and to the applicability of the novel to people from all walks of life, and of all gender and racial backgrounds. Schlegel, Chris. "The Color Purple." LitCharts. LitCharts LLC, 20 Nov 2013. Web. 19 Apr 2019. Schlegel, Chris. "The Color Purple." LitCharts LLC, November 20, 2013. Retrieved April 19, 2019. https://www.litcharts.com/lit/the-color-purple.